The IRS routinely reviews accuracy of tax returns and anyone’s return can be analyzed sooner or later, it’s a random process. If you receive a notice that your tax returns will be audited, do not panic but educate yourself about on the entire process. An audit notice doesn’t necessarily mean that the IRS found something very wrong with your return; many times it’s a simple error in entering a Social Security number or a date of birth that can trigger the audit. One way or another, the IRS wants answers to some questions that your returns raised. All communication with the IRS – that includes correspondence and phone calls. Make all arrangements with the IRS with respect audit appointments. Review your tax return and documents before forwarding them to the IRS. 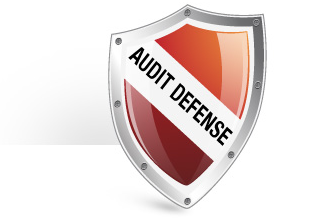 Assist with other audit related notices. Audit Defense cost is additional to the tax preparation software and must be purchased before you receive an audit notice for a timely filed income tax return. TurboTax products have some free built in features that can help you assess audit likelihood, what to expect, and how to proceed. When you finish you tax return, TurboTax checks it for common audit triggers and displays results on Audit Risk Meter. Remember that even if the meter shows a low risk of audit, it does not guarantee your return won’t be audited. The software also offers guidance on what to expect in case of an audit, questions you may be asked, and who to contact. Finally, Audit Support Guarantee, offers free year-round guidance from a tax professional who will answer all the questions you may have, and who will assist you in getting ready for an audit. So is this extra protection worth the cost? Well, for the average tax payer with a simple tax return, we believe this might not be necessary. However, for those small business owners with large deductions, losses, or complex returns, this service can be well worth the extra costs. Audit Defense is not worth it. I purchased it each year that I used the Turbo Tax software to do my taxes. I got audited for the 2009 tax year. Audit Defense assigned someone to our case, and that person from the very first day made it his goal to drop our case. We were in the middle of a move, and most of our items were packed away. We had things in storage, movers coming, relocated and had a house hunting period, etc. I was able to find most receipts from that year, but not all. I started off with over a $12000.00 tax bill, including interest and penalties. All Audit Defense did was act as a middle man. They never talked to the IRS. They simply had me fax them all of my documentation, which they in turn faxed to the IRS. I could have done that myself. If we didnt call the representative back the same day, he’d leave a message saying he was going to drop our case. I even updated my contact info on the main page and he told me that he didnt have my current contact info. I advised him that it had been updated, and double checked to make sure it was there and lo and behold it was. He just was too lazy to look at the screen. I repeatedly told him to call my home number because I had no cell phone coverage while I was at my home, and he refused to call the correct number. My initial receipts reduced the tax bill to just over $8,000 but the IRS failed to recognize one of my receipts. I had to point that out to the representative at Audit Defense because he took the “good enough” attitude and wanted to close the case. I re-faxed the receipt to him, and he supposedly sent it to the IRS. I got a “final determination” back and still no acknowledgement of the receipt provided. The representative, “Ben” (who was probably from India, as he was very difficult to understand on the telephone) closed my case. I was not satisfied. But he had worked from day 1 to simply close my case without doing anything. So, I decided that since he was just a middle man, forwarding my documents to the IRS and doing nothing else, I would call the IRS directly. After all, I no longer had “Ben” threatening to close my case if I spoke to the IRS. So, I called the number on the determination letter, was on hold for just over an hour. Put it on speaker phone and worked while I was waiting. A helpful agent came on the line. I advised her of the issue. She told me that Audit Defense never sent them the final receipt and she gave me the fax number and instructions to send it to them. I did that, and within a couple of weeks, I got a new letter from the IRS. Instead of an $8,000.00 tax bill, I now have a $3,000.00 tax bill, down from the original $12,000 tax bill that the IRS originally sent. Pretty good work. Audit Defense about cost me $5,000.00. Nice, huh? I believe I could have provided more receipts and had the bill reduced even further, but things get lost in the move, and I still have not located the other receipts that do exist. Moral of the story: If you have filed your returns and they are legitimate, and you have saved your receipts, Audit Defense wont do a thing for you that you cannot do for yourself. Nothing. And all of the webistes with the great reviews are paid for by Audit Defense and Turbo Tax, most likely.